2017 saw the Atlantic Ocean break seven records for hurricane activity and severity. The accumulated cyclone energy was 50% above the level required for the season to be considered extremely active. While credible observers attribute the severity and frequency of hurricanes during 2017 to be attributable to global warming, this isn’t a statistical slam dunk. The fingerprints of warming are there, but still, only one year. If the Atlantic were the only region with hurricanes, then this wouldn’t be a strong indicator. But it isn’t. However, hurricanes aren’t called hurricanes in Asia, but even in English-language press are referred to as typhoons or cyclones. What’s been happening in places that don’t call hurricanes hurricanes? Typhoons which hit land in Asia have increased in severity, with clear increases of high-severity storms over the past 37 years. That’s not a single year of bad storms, that’s 37 years of trending increases in severity. The best study on the subject is a statistical analysis published in Nature Geoscience, which has a very robust impact factor of 12.05. This is a very credible journal, so papers in it can be considered more reliable. The paper was co-authored by Wei Mei & Shang-Ping Xie from the Scripps Institute of Oceanograpy. The following is directly quoted from the abstract of the paper. over the past 37 years, typhoons that strike East and Southeast Asia have intensified by 12–15%, with the proportion of storms of categories 4 and 5 having doubled or even tripled. […] We find that the increased intensity of landfalling typhoons is due to strengthened intensification rates, which in turn are tied to locally enhanced ocean surface warming on the rim of East and Southeast Asia. 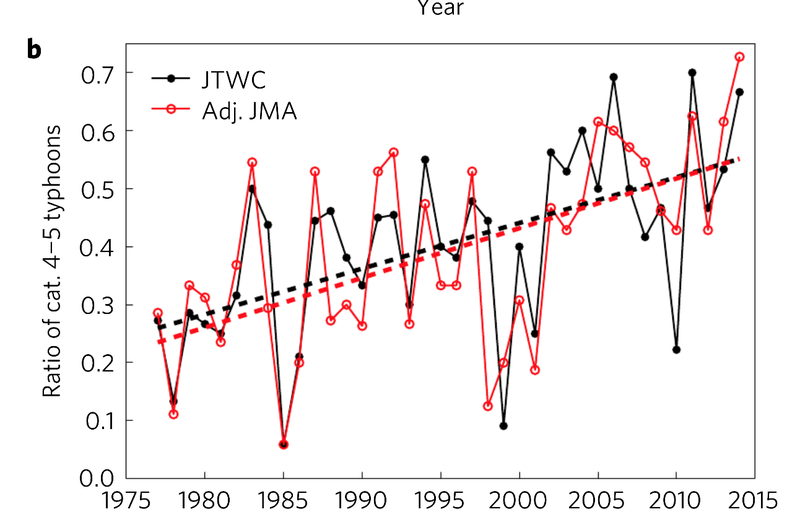 The projected ocean surface warming pattern under increasing greenhouse gas forcing suggests that typhoons striking eastern mainland China, Taiwan, Korea and Japan will intensify further. Here are a couple of key graphs from the paper that make the trend readily apparent. This graph shows the clear trend of increasing peak intensity. 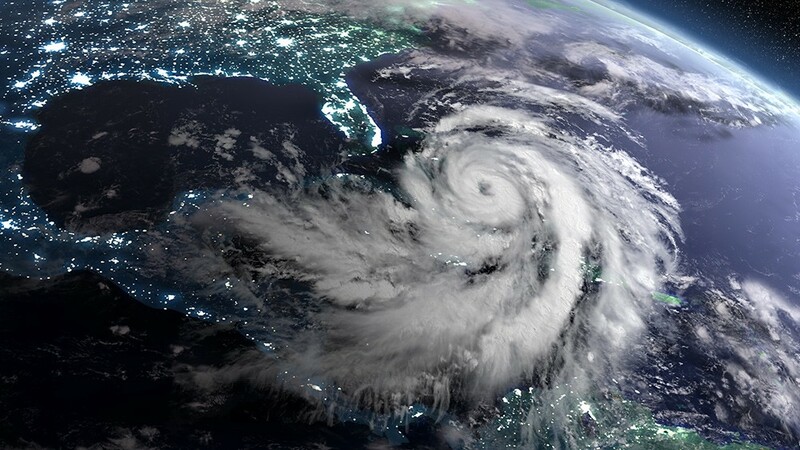 The references in the body of the article become valuable in assessing the fingerprints of climate change on the empirical increases in severity of typhoons. CMIP5 models project faster warming rates north of ∼20◦N under both representative concentration pathways (RCP) 4.5 and 8.5 scenarios (Fig. 4d and Supplementary Fig. 12a). This SST change pattern acts to strengthen potential intensity over the subtropical ocean (Supplementary Fig. 12c,d; see also ref. 35). This favours the intensification of Cluster 1 and 3 typhoons, heightening risks of typhoon damage to eastern mainland China, Taiwan, Korea,and Japan. 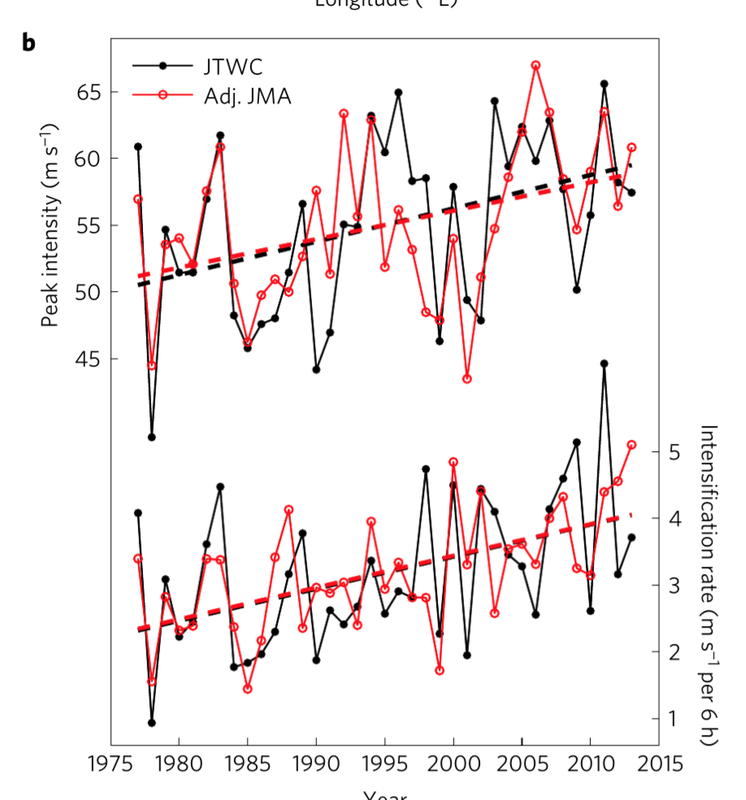 As is appropriate for a scientific paper, this cautiously notes that the sea surface temperatures are in line with IPCC models, and hence there is a reasonable inference to be gathered that anthropogenic global warming and climate change are at least partially causative of the observed increased in frequency and intensity of higher intensity typhoons in Asia. The authors are clear that further warming will exacerbate this increase regardless of attribution at present. For those interested in the CMIP5 model within the IPCC overall framework, here’s a useful set of material: An Overview of CMIP5 and the Experiment Design. A hurricane by another name is still a hurricane. Globally, they have been increasing in severity in line with projections for decades. But because of specific conditions in the Atlantic related to wind shear, it’s believed that the effects have been dampened in places with lots of English-language press. 2017 may have broken through that, and may be a harbinger of more intense hurricane seasons to come.